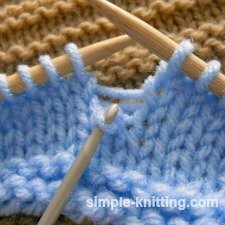 A very common knitting mistake is a dropped stitch. 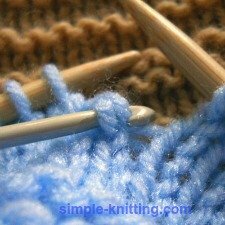 Sometimes a stitch just slips off your needle and you may not even notice until you have worked a few rows or maybe your knitting needles are really slippery and it just flew off the end. Eek! Oh my gosh, now what? First of all, I know it's scary but it'll be OK. In fact it happens all the time. What happens is it creates a run in your knitting very much like a run in stockings actually. It looks awful doesn't it and somehow it looks like a very big mistake because of the hole. It's weird how one dropped stitch can make a big hole like that isn't it? Never fear, help is on the way and it's an easy fix too. Again, stay calm. I know how you feel when you see it. And dropped stitches always look really bad but honestly it really looks much worse than it is. Knitting mistakes happen all the time. Umm well they do with me that is. And really they are just minor inconveniences. OK they're a pain in the whatsis but that's all. 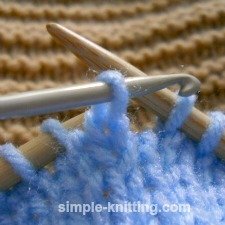 Before we start, go grab a crochet hook around the same size or even a little smaller than your needles. I'll wait. 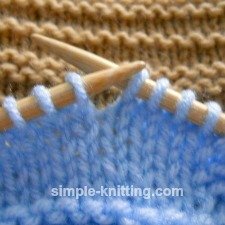 This is a dropped knit stitch. See those ladders or lines of yarn? And if you follow the ladder down you'll find that wayward dropped stitch. Knit over to the spot where the dropped knit stitch is. You want to knit all the way up to the right of it. First photo. 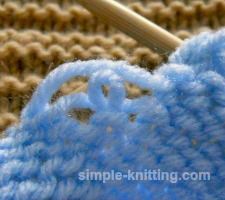 With your crochet hook push it through the dropped knit stitch from front to back. 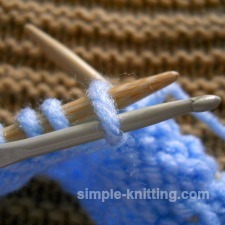 Then hook the very first ladder onto the hook with the stitch. Notice that the ladder is behind the stitch. Left photo. With your crochet hook bring the ladder of yarn through the stitch and like in the right photo pull it all the way through. 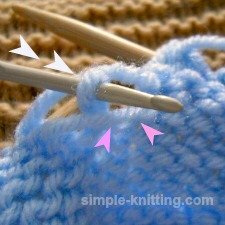 Then all you do is slip the fixed stitch back onto your left needle. I do it with my crochet hook but you can do it any way that you like. 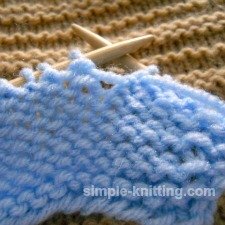 Make sure that it is facing the right way too so that you don't have a twisted stitch. The last photo just shows it all finished. It sure looks better now doesn't it? And it looked so awful before. 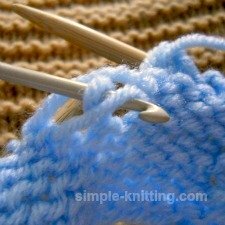 Basically you're doing the same thing with a dropped purl stitch. 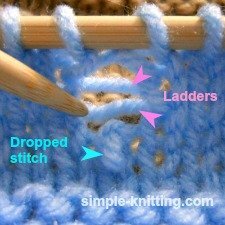 The only difference is that you need to place the ladder (yarn) in front of the dropped purl stitch. 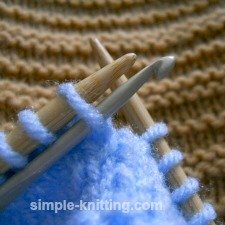 Another option to fixing dropped purl stitches is to simply turn your knitting around to the knit side and fixing it that way. 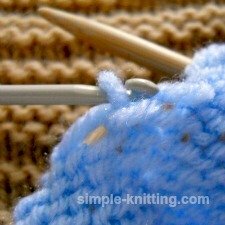 If you are working Stockinette stitch in particular it's a simple easy fix. I do that sometimes because it is a lot easier. Sometimes though you may not be able to do that depending on what you're knitting. 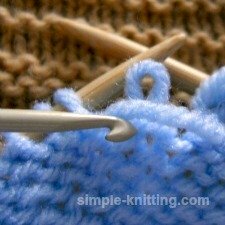 You will need to bring the ladder (yarn) to the front of the stitch, first photo, and the hook goes into the dropped purl stitch from back to front, second photo. So now using the crochet hook bring that ladder through the dropped purl stitch and pull it through. Now you just want to place the stitch back onto the left needle. Second photo. All done. Yippee. It's really pretty easy isn't it? 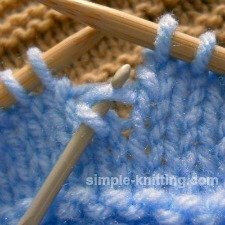 Now if the purl stitch dropped a few rows all you do is take the hook out of the stitch, put the ladder in front of the stitch and repeat my instructions for fixing it. I have a wonderful video that will help you as well. Please don't be put off by the length of it. It runs for approximately nine minutes but this wonderful gal shows you how to fix dropped knit stitches on Stockinette, dropped purl stitches on Stockinette and as well dropped garter stitches. Each segment is roughly three minutes and you'll be able to stop the video after each section. I hope that helps. Happy Knitting!